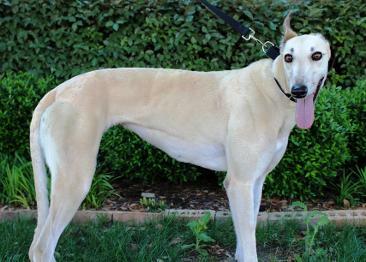 History: Rita ran approximately 25 races (more than recorded on Greyhound-Data) but was not competitive. She was retired to the farm and hopefully to a forever home soon. She rides well in the car and did what she was supposed to do outside on a leash. Rita loves to play and be in the middle of the action. What a happy, friendly girl. 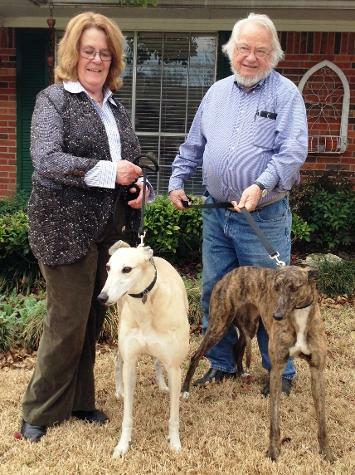 Rita and Lucy became part of the Grimes family and will now live in Waco. March 23, 2014 update: Rita found her loving lifetime home with the Grimes family and has a new fur-sister Lucy, also adopted today. 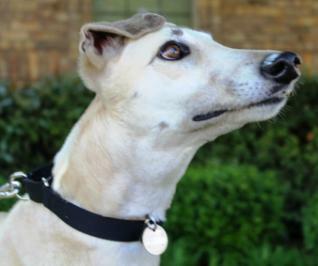 March 13, 2014 update: Rita was returned to TAGS to continue her search for her lifetime home. This was due to her family falling on hard times and nothing that Rita did. Milady was returned along with Rita. 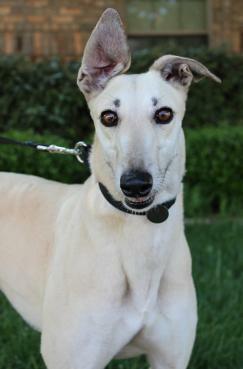 July 14, 2012 update: Rita adopted to her lifetime home with mom, Sally and Greyhound sister Milady. July 11, 2012 update: After almost three months in an adoptive home, Rita’s owners decided it would be better for Rita to be in a more active home and where the people were at home more and able to interact with her more. They returned her to TAGS but said she is a wonderful dog, crates well, walks well on a leash and is cat tolerant (even snuggled with one of the cats). Rita hopes to now find a home she will never have to leave. April 30, 2012 update: Adopted to her lifetime home and has a new name; Nova. April 12, 2012 update: Came to TAGS to find her lifetime home.